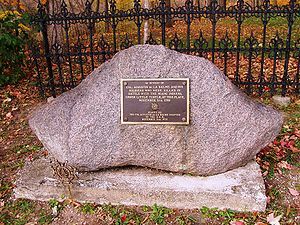 The Battle of Klock’s Field, also called the Battle of Failing’s Orchard; and occasionally as the Battle of Nellis Flatts, was an encounter between Albany County, New York militia and a British-supported expedition of Indians and Loyalists led by Lieutenant Colonel Sir John Johnson and Captain Joseph Brant. 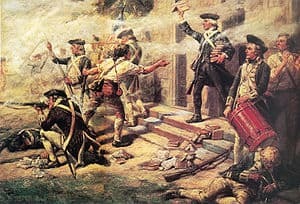 On October 19, 1780, Johnson and Brant’s army of Indians and Loyalists—consisting of units from the King’s Royal Regiment of New York, Butler’s Rangers, and Brant’s Volunteers—proceeded to destroy homes and farm buildings in Stone Arabia (a village about one mile (1.6 km) north of Fort Keyser, in modern Palatine Township in Montgomery County, New York). 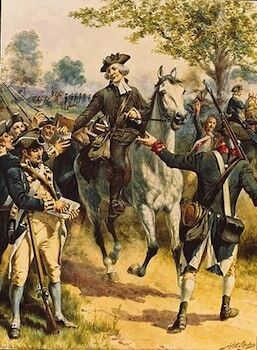 Colonel John Brown, commanding a force of Massachusetts levies and New York militia and rangers, advanced from his post at Fort Paris with the aim of defeating one of Johnson’s detachments, which British deserters had told him was isolated and smaller than his 360-man garrison. Instead, Johnson met Brown with his main force and, gradually outflanking and enveloping the rebels, defeated them in a running battle, during which Brown was killed. Late in the day Brigadier General Robert Van Rensselaer, commanding units of the rebel militia from central Albany County, New York and New York State Levies under the command of Colonels John Harper and Lewis DuBois, caught up with Johnson on a farm owned by George Klock in the easternmost portion of Lot 16 of the Francis Harrison Patent. A running battle ensued which lasted until the Loyalist forces were outflanked by the left column of Van Rensselaer’s force on the flatts of George Klock’s farm on Lot 17 of the Harrison Patent just to the south of the modern rock quarries of Hanson Aggregates about one and a half miles (2.4 km) west of Saint Johnsville. The fighting continued quite briskly until it became painfully apparent to General Van Rensselaer that his right and left flanks were firing upon one another and the General ordered his men to retreat to the house of George Klock near Timmerman’s Mill where they could be properly victualed and rested after having been on the march and in battle for approximately 26 hours with only a couple of hours rest. Becoming aware of Van Rensselaer’s cease-fire, Sir John and Brant ordered their men to cross the Mohawk River at King Hendrick’s Ford to avoid the necessity of approaching either Fort House on the west bank of the East Canada Creek or Fort Windecker [formerly known as Fort Hendrick] immediately opposite. During their precipitous escape, Johnson’s men were forced to abaondon their cannon, their baggage, and most of the prisoners they had captured earlier.